In the poll planned for next week we are going to be offering the full Grand Exchange along with some additional quality of life questions. In this developer blog we will be going over the Grand Exchange system and clarifying exactly what would be implemented into Old School. The Grand Exchange is a system that aids players in buying and selling items. If it were released the trading post would be removed. It would not replace the original, manual trade system, it would exist alongside it. 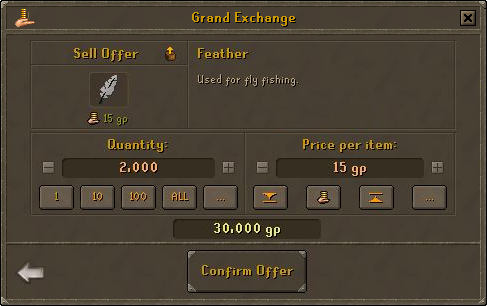 The sale of items through the Grand Exchange determines the market value of the items sold. The market value represents the average value of the item based on recent trades and is updated every 6 hours. While RS3's Grand Exchange has website features to track the price history of all the items, it may not be possible for us to get all those features added to the Old School website alongside our launch of a Grand Exchange. Nevertheless, we would aim to have them added as soon as possible. If you wanted to trade items through the Grand Exchange you would head to the Grand Exchange building north-west of Varrock and talk to a Grand Exchange clerk. You would then be shown an interface with 6 slots. Each slot can be used as either a buy or a sell offer. If you choose to sell an item you will then be prompted to select the item from your inventory and then set a price. The price of the item when you initially select it will be the market value and you are free to increase or decrease your asking price. After you confirm your offer the items you are selling will be stored in the Grand Exchange. It is then down to your fellow players to put in an appropriate buy offer in order for your item to sell. Your trade will complete once a buy offer has been found to match your sell offer and you will be able to collect the coins from either the Grand Exchange clerk or any bank around the game. If you wish to buy items through the Grand Exchange you will need to return to the offer screen and select the 'Buy' option on any open slot. You will then see a screen asking you to search for an item. Here you can look for any tradeable item in the game. After searching for and selecting the item that you wish to buy you will then have to choose what quantity of the item you wish to buy and how much you want to pay for each item. Once you have confirmed your offer the Grand Exchange the coins to cover the offer will be taken from your inventory and stored in the Grand Exchange. 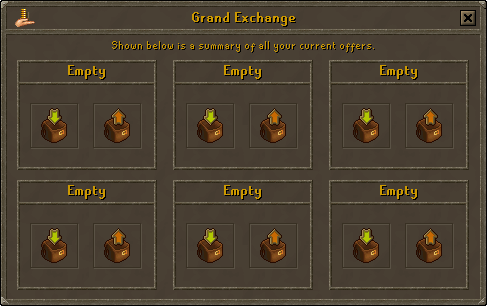 The Grand Exchange will check if there are any matching sell offers available. If a match is found you will receive the item(s) you were purchasing and any remaining coins due to players selling items for a price lower than what you were offering to buy them for. You can then collect your items from the Grand Exchange clerks or through the collect option at any bank in the game. Just to be clear, if the Grand Exchange is introduced there will be absolutely no price limits. One issue that the Grand Exchange may bring along with it is the possibility of price manipulation. While a large majority of items will remain unaffected, some items that are traded infrequently may end up with their prices being artificially altered by large groups of players in order to profit. In order to combat manipulation there will be limits on the rate at which you can buy different types of items. These limits will be generous and will likely not interrupt any day-to-day trading that you are doing but they will go a long way in making sure that items are not bought out in bulk. There would be no limits on sell offers and these limits will only affect the Grand Exchange. You would still be able to trade through the trade screen as usual if you needed items in bulk. 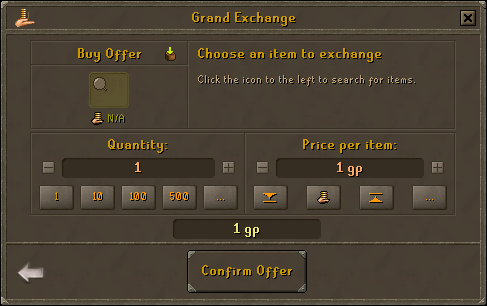 If the Grand Exchange is introduced into Old School we would also add a price checker interface so you can see the value of your items from anywhere in the game. A button to open the interface would be added next to the button to open the items lost on death interface. With the Grand Exchange in Old School we will have the ability to offer CoinShare, a system that automatically converts signature drops to their market value and offers the item on the Grand Exchange. We will look at polling CoinShare once we know whether or not the Grand Exchange will be coming to Old School. Note: The images used to illustrate how the Grand Exchange works are of the original Grand Exchange menus from 2007. For Old School RuneScape, we would use similar menu layouts, but the screens and buildings would not be identical. Question: Should we introduce the Grand Exchange? The trading post would be removed and replaced with a Grand Exchange building north-west of Varrock. A 'Collect' option would also be added to every bank. In the case that the Grand Exchange does not pass we will also be offering a couple of changes to the trading post. The first is to hide offers from players that do not have their private chat set to 'On'. This would ensure that anyone with a visible offer on the trading post would be able to receive your private messages and would save you the time of adding players that cannot be contacted. The second would be to add the ability to open the trade interface with players through the trading post. They would have to be on the same world as you, and in a bank area. Even if the Grand Exchange does not pass, we would be able to offer some form of LootShare system in a future poll if you like.. Question: If question 1 fails, should we update the Trading Post to hide offers from players who've set their private chat to Friends or Off? Question: If question 1 fails, should the Trading Post let you click a player's offer to send them a trade request, allowing you to trade with them without meeting up? They would need to be in a bank on the same world as you. For some time the question of the dragon defender has been coming up. The Old School community have made it clear that the only place it can come from is the Warriors' guild and so we would like to offer a small expansion to the Warriors' guild. We would like to add a basement to the guild that can be accessed by showing Kamfreena a rune defender and receiving a key. The basement would contain large cyclops, a slightly more challenging version of the cyclops that has a chance of dropping dragon defenders. Players that do not have the defence requirement for the dragon defender would still be able to use the existing cyclops to get multiple rune defenders. Question: Should we add a basement to the Warriors' guild containing a bigger cyclops that has a chance of dropping dragon defenders? To access the basement you would need to show Kamfreena a rune defender to get a key. You would still need to pay the same token fee as you pay to access the cyclops on the top floor. Question: Should we increase the number of available bank slots for both free-to-play and members by 200? Question: Should we remove the 'Harpoon' option on the fishing spots found in Piscatoris? Question: Should we make messages from players that you add to your ignore list disappear? Question: Should saplings of tradeable seeds be made tradeable? Question: Should we allow Ava's devices to retrieve ammo regardless of where it landed? Currently they cannot collect ammo from anywhere you cannot directly walk to. Question: Should filtering public chat also filter chat seen over other players' heads? Question: Should we append the names of the Recipe for Disaster gloves to include the level they represent? For example, rune gloves. Question: Should we adjust the inventory appearance of maple logs and staffs to prevent them being confused with yew logs and battlestaffs in trade screens? Question: Should we remove the unnecessary dialogue when entering or leaving Sophanem for those who are allowed to use the gate? Question: Should we change Trouble Brewing to only require 1 player on each crew to start a game? Question: Should we add a right-click option to slayer masters to get an assignment? Question: Should we open the north side of Varrock west bank to provide access to the agility shortcut? Question: Should we add NPCs that unnote items for 5gp per item near certain general stores? These NPCs would be for the use of ultimate iron men as, although other players could then un-note their items without risk of other players taking them. 1 NPCs would be added to the Karamja general store, Rimmington, Pollnivneach and the Bandit camp. Question: Should a deposit-all button be added to bank deposit boxes? Question: Should we add a timer to the fight cave to tell you how long it took you to get from wave 1 to killing TzTok-Jad? Question: Should we add a fee of 50k to the priestess who collects your dropped items at Zulrah? She will also be made to show what items of yours she is holding and offer you the chance to discard them if you do not want to pay. Let us know exactly how you feel about the proposed changes. Your feedback is always vital when it comes to Old School updates so don't hold back. Looks promising to say the least, only problem I have concerns with is the effect the ge has on prices of items. Grand exchange is Love, Grand exchange is Life! Although I personally dislike the Grand Exchange and think the trading post long distance trading is perfect solution, I do see how people could vote yes and I have a few suggestions I'd like to post. Please if we do have the Grand Exchange, could we have the hub be in Falador Park? I think that offers a much more nostalgic approach to it & would also be a unique spin on a particularly controversial update. Another suggestion would be to allow all these new trading posts we have in banks to be able to be used as Grand Exchange booths. Perhaps it's not something you'd want as it decentralises the whole thing, but it's also a pretty handy option to have. I have a question also, you said there would be a limit on items but what I gathered from the post the limit will only be on certain items? Therefore I assume herbs/fish/general consumables will be unlimited? I could have the wrong end of the stick here but it'd be nice to just double clarify that! Thanks Ash for providing a very good and clear answer on page 11.